Bishop, b. between 952 and 962; d. 10 April, 1028 or 1029. Mabillon and others think that he was born in Italy, probably at Rome; but Pfister, his latest biographer, designates as his birthplace the Diocese of Laudun in the present department of Gard in France. He was of humble parentage and received his education at the school of Reims, where he had as teacher the famous Gerbert who in 999 ascended the papal throne as Sylvester II. In 990 Fulbert opened a school at Chartres which soon became the most famous seat of learning in France and drew scholars not only from the remotest parts of France, but also from Italy, Germany, and England. 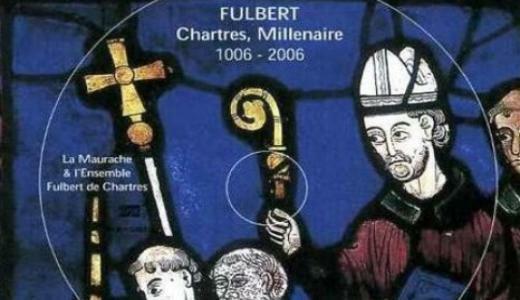 Fulbert was also chancellor of the church of Chartres and treasurer of St. Hilary's at Poitiers. So highly was he esteemed as a teacher that his pupils were wont to style him "venerable Socrates". He was a strong opponent of the rationalistic tendencies which had infected some dialecticians of his times, and often warned his pupils against such as extol their dialectics above the teachings of the Church and the testimony of the Bible. Still it was one of Fulbert's pupils, Berengarius of Tours, who went farthest in subjecting faith to reason. In 1007 Fulbert succeeded the deceased Rudolph as Bishop of Chartres and was consecrated by his metropolitan, Archbishop Leutheric of Sens. He owed the episcopal dignity chiefly to the influence of King Robert of France, who had been his fellow student at Reims. As bishop he continued to teach in his school and also retained the treasurership of St. Hilary. When, about 1020, the cathedral of Chartres burned down, Fulbert at once began to rebuild it in greater splendour. In this undertaking he was financially assisted by King Canute of England, Duke William of Aquitaine, and other European sovereigns. Though Fulbert was neither abbot nor monk, as has been wrongly asserted by some historians, still he stood in friendly relation with Odilo of Cluny, Richard of St. Vannes, Abbo of Fleury, and other monastic celebrities of his times. He advocated a reform of the clergy, severely rebuked those bishops who spent much of their time in warlike expeditions, and inveighed against the practice of granting ecclesiastical benefices to laymen. Fulbert's literary productions include 140 epistles, 2 treatises, 27 hymns, and parts of the ecclesiastical Office. His epistles are of great historical value, especially on account of the light they throw on the liturgy and discipline of the Church in the eleventh century. His two treatises are in the form of homilies. The first has as its subject: Misit Herodes rex manus, ut affligeret quosdam de ecclesia, etc. (Acts 12:50); the second is entitled "Tractatus contra Judaeos" and proves that the prophecy of Jacob, "Non auferetur sceptrum de Juda", etc. (Genesis 49:10), had been fulfilled in Christ. Five of his nine extant sermons are on the blessed Virgin Mary towards whom he had a great devotion. The life of St. Aubert, bishop of Cambrai (d. 667), which is sometimes ascribed to Fulbert, was probably not written by him. Fulbert's epistles were first edited by Papire le Masson (Paris,1585). His complete works were edited by Charles de Villiers (Paris, 1608), then inserted in "Bibl. magna Patrum" (Cologne,16l8) XI, in "Bibl. maxima Patri." (Lyons, 1677), XVIII, and with additions, in Migne, P.L., CXLI, 189-368.